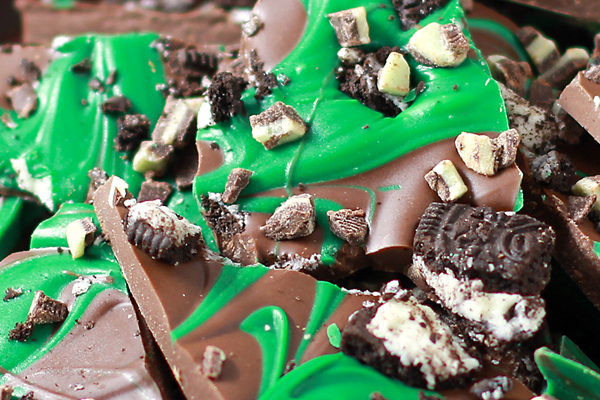 Chocolate Mint Oreo Candy Bark is a simple rcipe loaded with chocolate and mint . It is cool, creamy and chocolaty with just enough crunch to satisfy all my senses. This recipe has only a handful of ingredients and comes together in just 10 minutes. There are a few times each year that I absolutely crave mint and chocolate. The first is during spring time. St Patrick's Day is the perfect time to quench this craving! I like to whip up a batch of this simple treat and share it with friends for the Irish celebration. Granted this is a very American version of a St Patty's Day gift, but I am American. So it works. ;) Another time that I really love chocolate and mint is during Christmas. For Christmas I whip up several batches and pack them up in clear treat bags. Tie them with a pretty ribbon and attach the recipe. It makes a really fun gift and the recipients are always very grateful. It is so easy, you are going to melt the candy confections, stir in mint and green food coloring and pour into a pan. 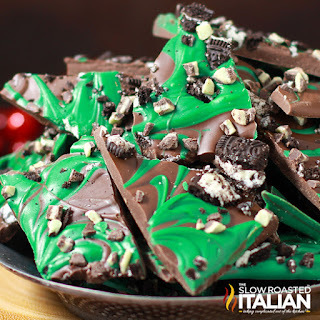 Swirl to create a beautiful candy bark and sprinkle with Oreos and Andes mint. Chill it in the refrigerator or freezer for 20 minutes and then break apart. I use a butter knife or just rap the pan on the counter. Seriously, what could be easier? You are going to be loving this all year round and as a gift, can you just imagine bringing those little gift bags to work or school? In a medium microwave safe mixing bowl, add chocolate almond bark and heat at 30 second increments until they are melted. Stir between each interval and once melted stir until smooth. Set aside. In a separate medium microwave safe mixing bowl, add vanilla almond bark and mint extract. Heat at 30 second increments until they are melted. Stir between each interval and once melted stir until smooth. Add food coloring (as desired) and stir until smooth. Pour chocolate onto a baking sheet and spread smooth. 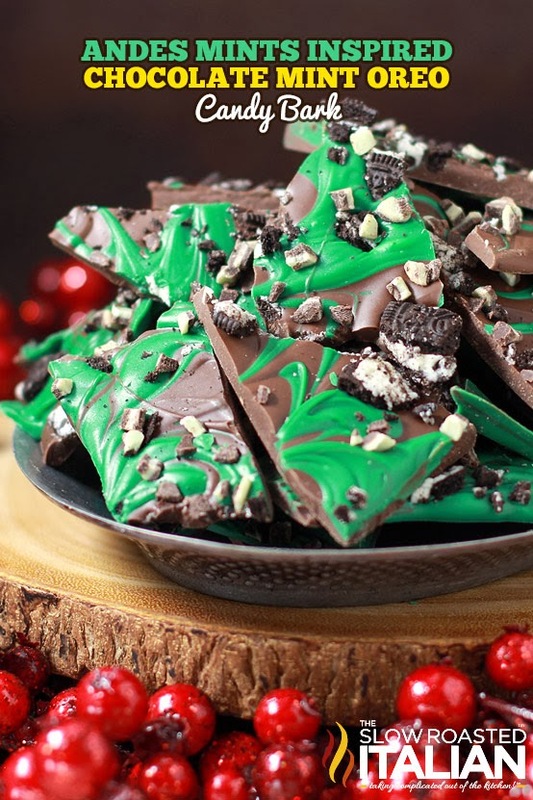 Drop green melted almond bark by the tablespoonful. Swirl with a toothpick or a spoon. Sprinkle with Oreo’s and Andes baking chips. Press lightly onto the Oreo's and Andes. Refrigerate for 20 minutes until set. Use a butter knife to break candy bark into pieces or rap pan on counter top to break apart.